Vlad and I are headed back to Florida today after a great stint in NYC. Our favorite part has been meeting all of the designers. We will be bringing you many designer interviews shortly. And one of those interviews will be with Carlos Falchi. His story is amazing, and I will leave it at that until we share more. And his handbags are amazing as well. While Carlos Falchi is known for exotics, he still has some microfiber bags and other materials that look astounding and have a much more affordable price point. 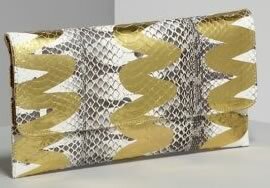 One of my favorite snake-embossed microfiber bag is the Carlos Falchi Slim Proof Hobo Pouch. 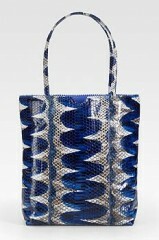 This bag is designed with Barbarella, the textured snake-embossed microfiber, which I mentioned earlier. 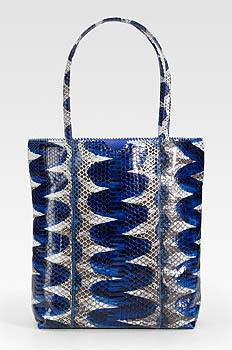 This material brings volume to the bag and looks like snakeskin, without the cost. The hobo shape of this bag I adore. I saw it and tried it on in the showroom (in CROCODILE, drool) and have been hooked since. 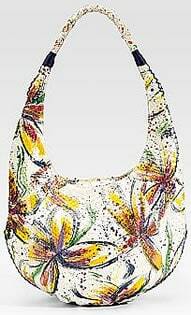 There is a detachable shoulder strap with a 25″ drop and double handles with a 5″ drop. The drawstring and slide closure is something I am drawn to; simple, hardware free, and casual-chic. On the inside you will not feel disappointed, as there is a zip pocket, cell phone pocket, money clip and key holder. Dimensions are 10Â½”W X 11″H X 5″D. Buy through Saks for $370. patchwork East/West tote we reviewed earlier this summer. So if you would like to be able to meet Carlos Falchi or see his designs, make sure to check out his trunk show schedule! When many big name designers are pushing out leather hobos for over $2,000, it is time to prioritize. I refuse to buy a lifeless, uninspired bag because the designer name on the front. I expect quality, luxury, and a bag that will last me for seasons. In fact, many are straying away from the big designer labels to find the designers who will appeal over time and through trends. Exotic handbags are still a driving force in the handbag world, and designer Carlos Falchi knows precisely how to cater to this crowd. 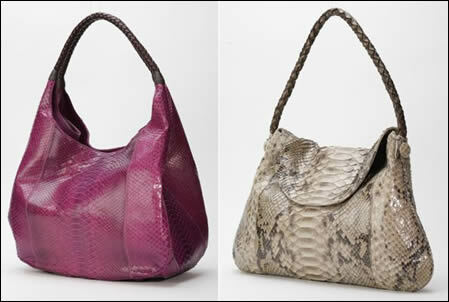 Carlos Falchi handbags implement exotic skins, chic designs, bright colors, and reasonable (for what you get) prices. 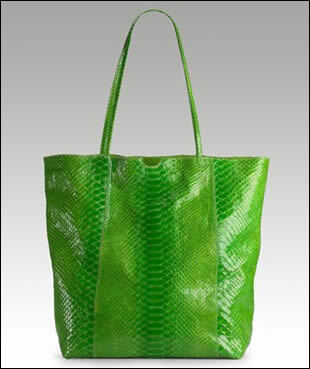 I love the bright eye-catching green of the Carlos Falchi Small Shopping Tote! The color is bold and in your face, but perfect for spring and summer, and perfect for next spring and summer, and the next and the next. The top opens with a magnetic closure and there is a zip pocket, blackberry, and cell phone pocket inside. The inside is lined with microfiber, which has become the go to for couches and the like because it is lush and easy to clean. Dimensions are 14″W X 13″H X 5″D. 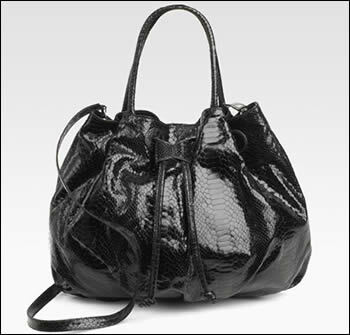 Buy through Saks for $1295, which is very reasonable considering it is exotic python skin. As my mom and I browsed Saks today, she was drawn to an exotic handbag hanging from the mannequin. One look and I knew it was Carlos Falchi. She loved the python, the handle, the bunching of the skin. Next thing I knew a gal passed us by sporting a different Carlos Falchi handbag. It was like an eye-opening experience, well, kind of. 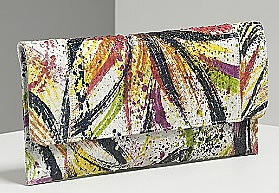 I think many Carlos Falchi bags are hit or miss (a total hit would be the ostrich clutch!). 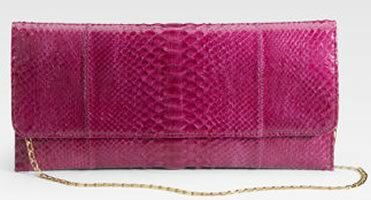 The exotic handbag look is still a huge hit, and while the economy slumps, many handbag aficionados are checking out more affordable but still chic exotic handbags. 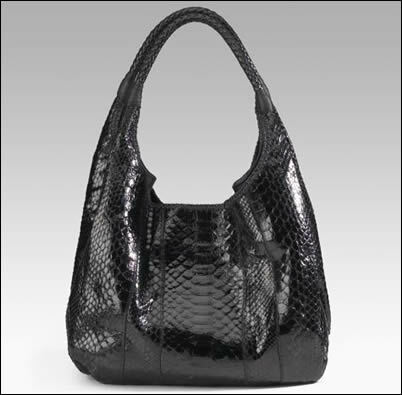 I am not saying Carlos Falchi Large Python Drawstring Tote is exactly more affordable, but it still is cheaper than many of the huge designer house exotic bags. 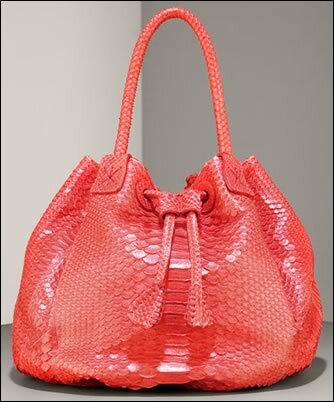 While this bag is available in both red and dark brown waxed python, the red is a sure hit. 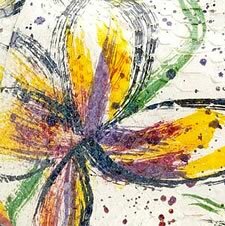 It adds the color spring is asking us all to wear and the exotic skin that we crave. There is a 6.5″ drop from the top handles and a drawstring top. 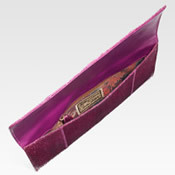 The inside is lined in sumptuous microfiber and features a side zip, two cell phone pockets, and a key holder. Dimensions are 11″H x 13″W x 9″D. This is a handbag my mom loves; casual, exotic, and a little different from usual. Buy through Saks for $2,725.